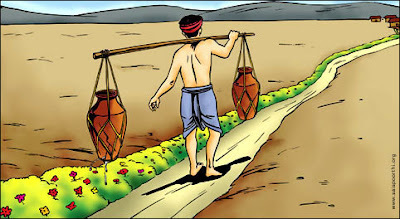 An Indian legend tells of a man who carried water to his village every day, in two large jars tied to the ends of a wooden pole, which he balanced on his back. One of the jars was older than the other, and had some small cracks; every time the man covered the distance to his house, half of the water was lost. It was so ashamed that one day, while the man got ready to fetch water from the well, it decided to speak to him: ''I want to apologize, but because of the many years of service, you are only able to deliver half of my load, and quench half of the thirst which awaits you at your home''.